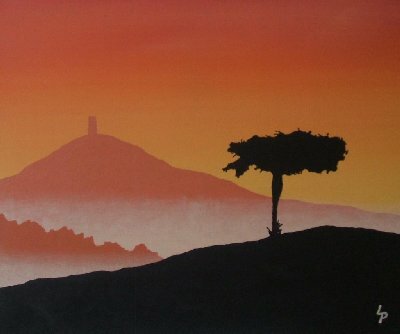 Since its starring role in Danny Boyle’s Olympic opening ceremony, friends have been asking me about the magical significance of Glastonbury Tor. Well, I don’t profess to know everything about the Tor. I doubt there are many that do. But I do live here in Glastonbury and, as a shaman, when I walk these lands, they reveal to me some of their secrets. And so I can share with you what I know, and also the thoughts of those more expert than me. In a nutshell, Glastonbury Tor is a huge vortex of spiritual and temporal power for these Isles of Wonder. Wnen Alfred the Great was trying to recapture them back from the Vikings, in the 9th century, he was camped out near here. But before that, as a child of just six, he had been sent to Rome to learn the great arts and his curriculum would have included magical alchemy, as this was practised by the monks of that time. And so it is my belief that Alfred used the power of the Michael and Mary leylines, which intertwine in a kind of etheric fertility dance to create the incredble vortic energies of Glastonbury Tor, to change who held the power in the land. After signing a treaty with the Vikings, to consolidate his power, a series of campaigns by Edward Elder and his sister, AEthelflaed, known as the Lady of the Mercians, swiftly saw off the countrymen of Eric Bloodaxe and Ragnald son of Sygtrygg ~ and they haven’t been back since! Of course, it’s no great news that the powers-behind-the-thrones use their knowledge of the occult to maintain their position at the top of the pyramid. But that they have been doing so since the 9th century may be new. I’m not saying that this is necessarily a good or a bad thing. It’s mainly those who haven’t shaken off their Christian conditioning that are terrified of magic and automatically assume anyone using it must be the devil in disguise. It’s just another way of wielding power ~ and the word ‘occult’ means ‘hidden’ because it is performed away from the prying eyes of those who would wish to stop it, of whom there have been more than a few over the past couple of thousand years. But it’s clear that whoever does rule world affairs knows about the power of magical ritual and ceremony on the psyches of the masses, which in itself is a kind of alchemy that creates new life, or new realities, and this is also a form of magic. I was reminded of this during the Olympic Stadium scenes which brought to life the dreams and nightmares of the children of Great Ormond Street Hospital and alluded to the creation of its main benefactor, the author J M Barrie, Peter Pan ~ who I’m sure most have figured out is the great fertility god Pan, rumours of whose death have been greatly exaggerated. 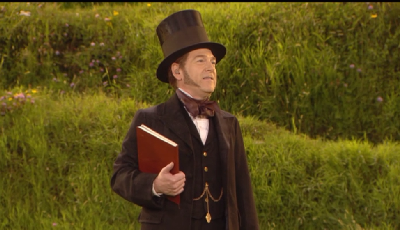 These same dreams were also referred to when the words of Caliban from Shakespeare’s The Tempest, were delivered by the actor Kenneth Branagh as he stood on the Olympic Glastonbury Tor. It has always been the role of the wandering storyteller, bard, minstrel or poet to broadcast to the masses, through drama, tales and music, the stories that kings and princes want us to dream, in order to shape our day-to-day realities. And in these difficult and dangerous times, it was obviously felt that there was a need for a new and freshly inspired story while also harking back to our roots, to give us a sense of continuity and connection. Whatever story we’re told, if it’s told well enough, we will take it into ourselves and make it our own, so that when questioned upon it later, we will defend it to the hilt as if we had thought of it ourselves. This is because the story enters into our deepest subconscious through a kind of alchemy. A master storyteller like Danny Boyle knows how to weave his multi-coloured rug densely with multi-layers of archetypes and metaphors that our right side brain laps up with gusto while our left side brain, vainly searching for reason and rationale, is left reeling. So are you sitting comfortably? Then let me begin. 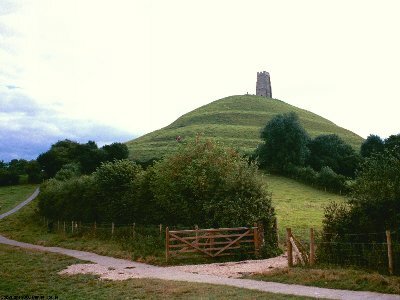 We began our story with a Blakeian image of Glastonbury Tor, and music set to the words of his hymn, Jerusalem, which allude to Jesus of Nazareth’s feet walking upon these green and pleasant lands. Jesus was here in Glastonbury first, in other words, before the revisionism of Bishop Iraneus, before the Synod of Whitby, before the Roman Catholicism of Constantine, before St Augustine was even a twinkle in his miserable and controlling mother’s eye. This would make Glastonbury the original birthplace of Christianity in the British Isles. Whether it’s true or not, it makes a good story and one that has, for more than a thousand years, caused no end of discomfort to the Roman Catholic church. But why should Jesus, even in myth, visit Glastonbury Tor? What is so special or even spiritual about an iron-impregnated hill in Somerset, sitting on beds of limestone, clay and marl? It’s really about the subtle energetic conditions pervading it, and these are naturally created by an aquifer of swirling waters within it, which were laid down many millions of years ago. Quantum physics is now catching up with vortical science ~ and we find that the vortex is the pattern which is preferred by water and all structures in water-dependent biological worlds. “The multiple layering of a vortex allows the greatest interaction between the elements within it. .. An essential procedure of alchemists was the solutio, in which the contents of the retort [long necked glass container] could be dissolved back into the prima materia as a first step in purification, preliminary to the creation of a new form. In the process, the mysterious Mercurius acted both as ‘supreme solvent’ and as the base matter in which the alchemist must return before making further progress. “While the Tor functions as an alchemical retort or alembic, its alchemical potency is due to the fact that it is also a point of interaction and connection with the revolving heavenly dimension. In Northern Europe, the summit of the axis mundi is attached to the Pole Star around which revolve the heavens ~ sometimes shown as the twelve houses of the Zodiac. The axis mundi is a conductor of celestial energy, sometimes shown as the lightening from the Gods and thus the passageway between worlds. To really understand how the alchemical processes of the double vortex of Glastonbury Tor work, you would need to read Nicholas Mann’s excellent book, The Red and White Springs of Avalon. 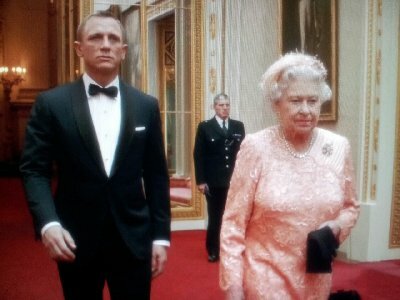 But suffice to say, kings and princes have been advised by alchemists since at least the 9th century and this was alluded to in the clip of Her Majesty the Queen and James Bond 007, the spy. The previous, Elizabeth, Elizabeth 1st, had an extremely famous astrologer and alchemist named John Dee in her court, who was also her spy and his cypher was also 007. I’ll just finish with another great story about Glastonbury, because it alludes to the final part of the opening ceremony. This ancient legend, passed on by the tin miners, is about Jesus’s uncle, who apparently came to Glastonbury from the Middle East, after the crucifixion, and he was carrying the red and white vials of Jesus’s blood and plasma. Of course this again is metaphor for alchemy, mirroring the red and white stages of the alchemical process (following the black or nigredo stage) and the red and white springs of Glastonbury Tor. But to go back to the story, when Joseph and his party arrived via the inland sea that surrounded Glastonbury in those days, they landed at Wearyall Hill and Joseph planted his walking staff there. The staff took root and sprouted, and eventually it grew to become the Holy Thorn of Glastonbury. Again, this story may just be a myth. But we do know that the Holy Thorn does come from the Middle East, because it flowers when Lebanon thorns do, in December (instead of at Beltane when the May thorns usually flower here) and from that tradition, a sprig of the Holy Thorn is always sent to the Queen on Christmas Day. For all it’s quaint, down-home, multicultural and socialist undertones, this opening ceremony of Olympics 2012 was an incredible show of power on the world stage. Mirroring the story about Joseph’s staff, but taking it much further, by the end of the Olympic opening ceremony, all the worlds’ flags were planted on Glastonbury Tor. Let no man deceive you? For the Kingdom of God is soon to come upon the Queen and crown, defeating the satanic rituals and the 23 Y chromosones of our savior and redeemer. Let the 20,000 deaths of starvation swim in your mind each day for the ignorance of stupidity for the kids in Africa and elsewhere in the world. The ruling elite will be the last to ever be invited in my Fathers heavenly Kingdom here on earth within the next four years in late October of 2016. What is the difference between right and wrong, good and bad? Look at your instructional manual to humanity, your blueprint for eternal life. Blessings Ishtar and……well, technology and magik ever slept in each others bed….and, as Fleming was well aware, John Dee’s cypher was 007…. whom did it serve…..for how many, somewhere between WTF and ‘holy crumbs!’, theatre and knowing collaboration, ‘ceremony’ and ‘secret service’….ner’less, a rippling vibration sent amongst the subterranean aquifers of the collective psyche…..’whom do you serve’? from catatonia or in catalysia, did we waken, or the spell bind, since, as Graves says of Caliban’s tongue….”the illogical sequence of tenses creates a perfect suspension of time.”….perchance, time will tell…. while the questing torch ignites deeper memories……by the raising of the one/many eyed pillar of fire…by Lugh’s pyre-rites…..be watchfull of your dreams this summ’ners night…..eh, Will? !